If you watched TV in Detroit from the late 60's through the mid-80's, you've likely seen Lawson J. Deming, as his character Sir Graves Ghastly. Primarily a Saturday afternoon horror host, Sir Graves was less edgy than the late night Ghoul. His beat was the corny, the silly, and the kid friendly. In the 70's (well, actually even NOW) i would watch pretty much any monster or science fiction movie, discovering each 'new' oldie as though it had been made just for me. i saw many Val Lewton films for the first time on Sir Graves, as well as iconic cult films like Track of the Vampire and Prince of Space. Based in Cleveland, Ohio, Deming entered TV production in 1949 at an NBC affiliate in Cleveland. He had lots of voice character experience from radio, which served him well on the tube. By the 60's he was a regular on Woodrow the Woodsman, a very successful kid's TV show. When the Cleveland station was sold in 1967, the new management dropped all children's programming, and the show and cast was wooed to WJBK TV2 in Detroit. TV2 had lost their syndicated late night horror host, the legendary Morgus the Magnificent of New Orleans, and they were searching for someone to churn those reels of trash and classics. Just weeks after Woodrow has resumed in the Motor City, Deming was called upon to invent a new character, an extremely non threatening and courtly vampire named Sir Graves Ghastly. Deming's theatrical background and kindly demeanor made for a devoted following of children and adults alike. Lawson played several other characters in skits on the show, including "Reel McCoy", "Tillie", "Walter", and my favorite The Glob. This guy was basically Deming's chin, shot upside down with eyes and nose painted underneath his lower lip. Blob would lip-synch songs from Gene Moss' Dracula's Greatest Hits and other goofy stuff. i was not a small child in the late 60's, but this still never failed to slay me. 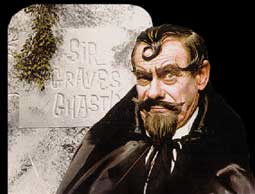 At the height of his (and horror hosts in general) popularity in the 70's, Sir Graves was also seen in Washington D.C. and Cleveland, where he still made his home. For a few years he taped a Saturday night show for the D.C. market, and a the afternoon show for Detroit. In 1982 the show was cancelled after 16 to make way for afternoon sports, but Lawson continued to work in broadcasting in Ohio until retiring with his wife Mary Rita. Last Tuesday he died of congestive heart failure at a Cleveland nursing home. He was 94 years young, and i know i'm not the only Detroiter who feels a bit of their youthful memories slip away with him. I adored the birthday club, and happily sang "You're Past Your Prime" every week! And the GLOB! ZOMG. Big LOVE for Sir Graves!